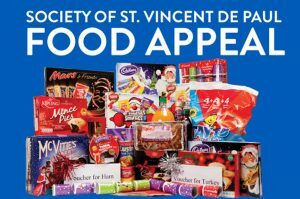 The national church gate collection for the Society of St Vincent de Paul takes place this weekend outside churches the length and breadth of Ireland. According to the PRO for the Society, in spite of the economic improvement in the country this year, calls for help are up. Mr Walsh said that the calls for help were up between 3 and 10 per cent, region to region. In the East region, which comprises Dublin, Wicklow and Kildare, “calls are up probably close to 10 per cent,” he said. While the Society appeals at Christmas in particular for money, toys and food, this year they have asked the public to remember teenagers if they are making donations of toys. There is a feeling, said Mr Walsh, that young children are well catered for. “Lots of toys are donated for them – cuddly toys and the like, and very often the teenagers are forgotten,” he said.